Our Spacesaver range of slim line garden sheds is the ultimate storage unit for those areas where space is limited. 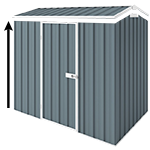 Fits under eaves and is large enough to be used as a free standing shed to store tools, sporting equipment etc. Ideal for storage in garages & carports in unit complexes. For permanent secure installation of your shed it is recommended to use anchors. To be able to secure each wall panels to the concrete slab you will need 12 anchors for this 2.3m x 1.5m shed.